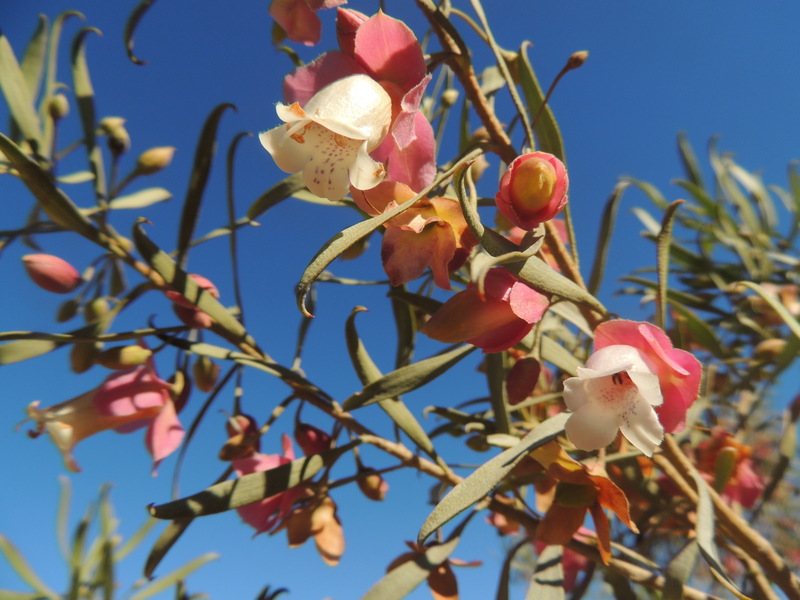 As you might guess, the Australian Arid Lands Botanic Garden in Port Augusta, South Australia, is devoted entirely to plants that grow in the driest parts of this continent. To the casual observer, the arid areas might seem dull and lifeless, but there's plenty to see: discovery requires careful observation. The Botanical garden was established in 1993 to encourage a wider appreciation of the flora that grows in the arid zones. 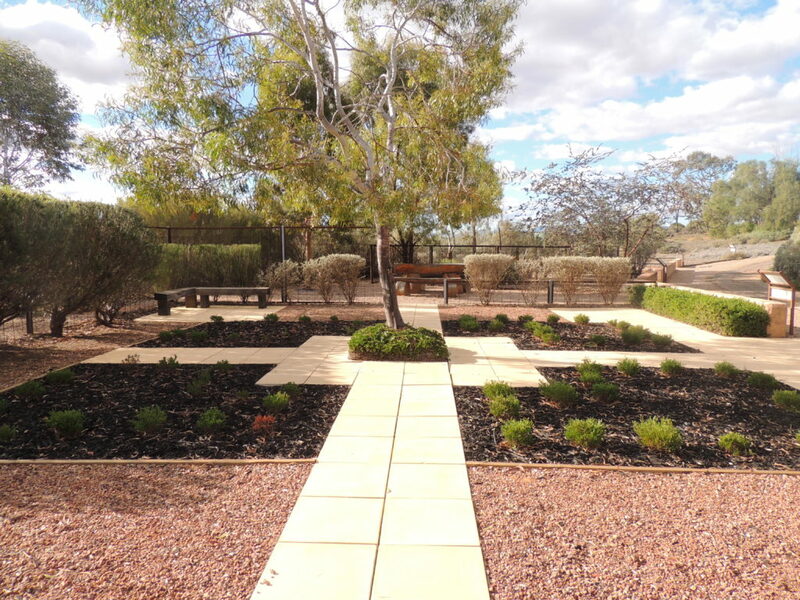 The 250 hectare garden is located in a stunning setting with views over the Upper Spencer Gulf to the Flinders Ranges. The visitor can wander along one (or more) of the walks within the park and enjoy the plants, birds and reptiles that make this area their home. 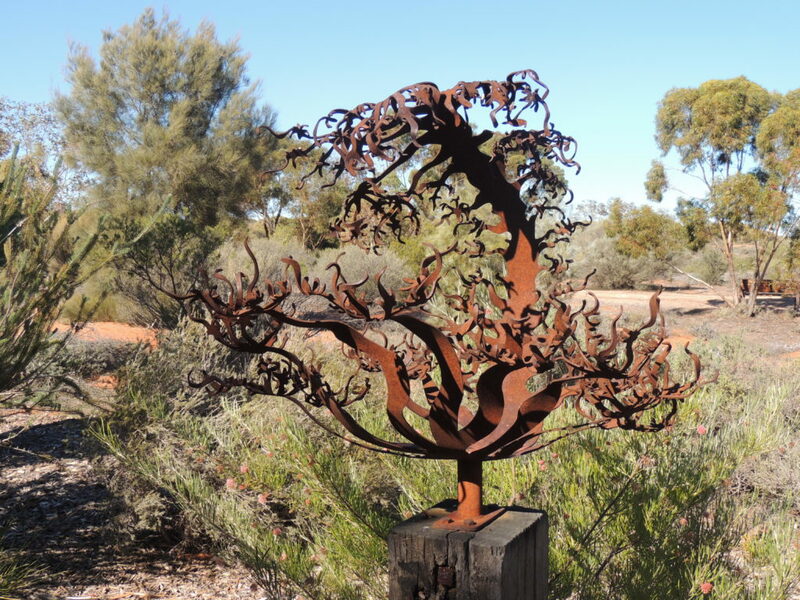 There are sculptures scattered about the garden, including this one, which is near the entrance, and is reflective of the tortured appearance of some native Australian plants. Or maybe it’s some kind of demented Triffid bent on mischief. Fortunately it’s firmly bolted to its plinth. Eremophilas, also known as emu bush, native fuchsia or turkey bush, belong to a large group of around 200 named plants and many of them grow in the Botanical Garden. As it is Winter, not all were flowering at their best at the time of our visit, but these two were quite lovely. The garden is home to a large selection of these plants. 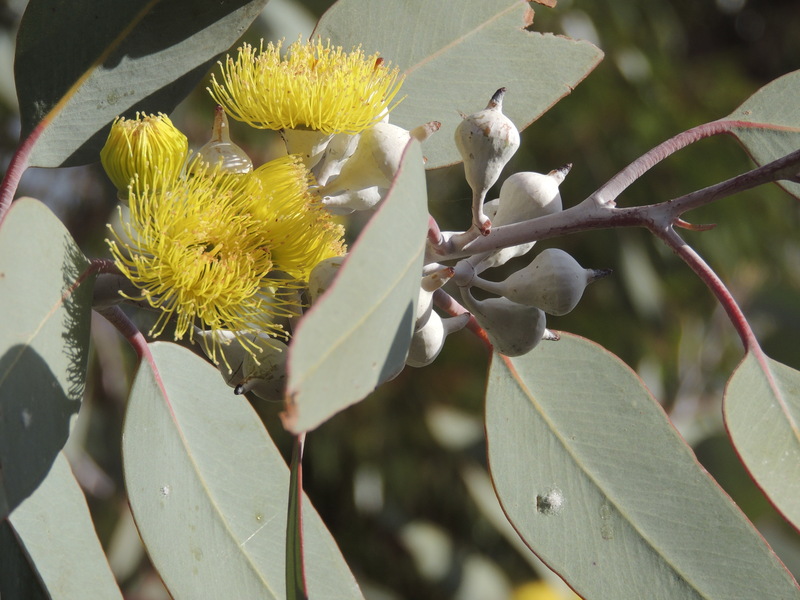 There are many species of eucalypts in the garden, some considered rare, perhaps because their habitats have been compromised in some way: logging, aggressive clearing of land for farming or encroachment by human habitation. 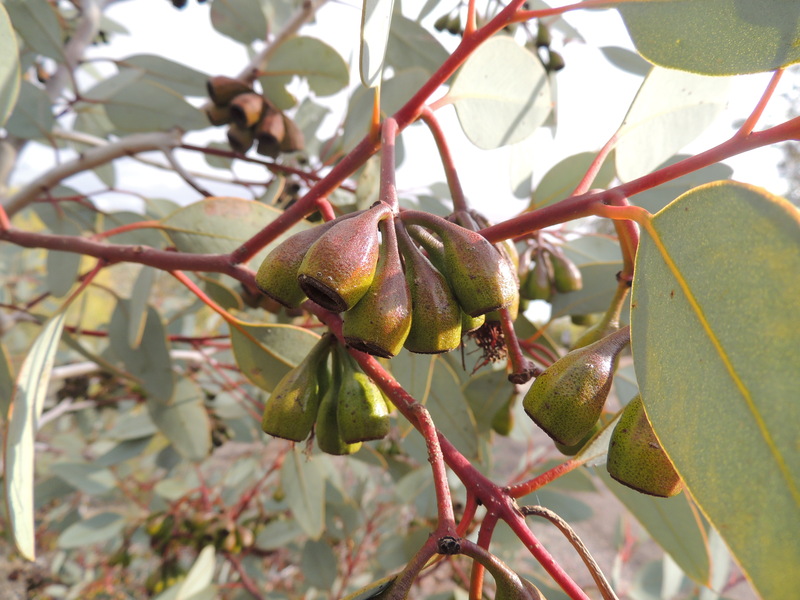 This Eucalyptus youngiana or Ooldea Mallee had the most amazing gumnuts. New buttons for your cardigan, anyone? Unfortunately it wasn't the right time to see them but its flowers are very large, as you can imagine, and a strawberry jam pink. 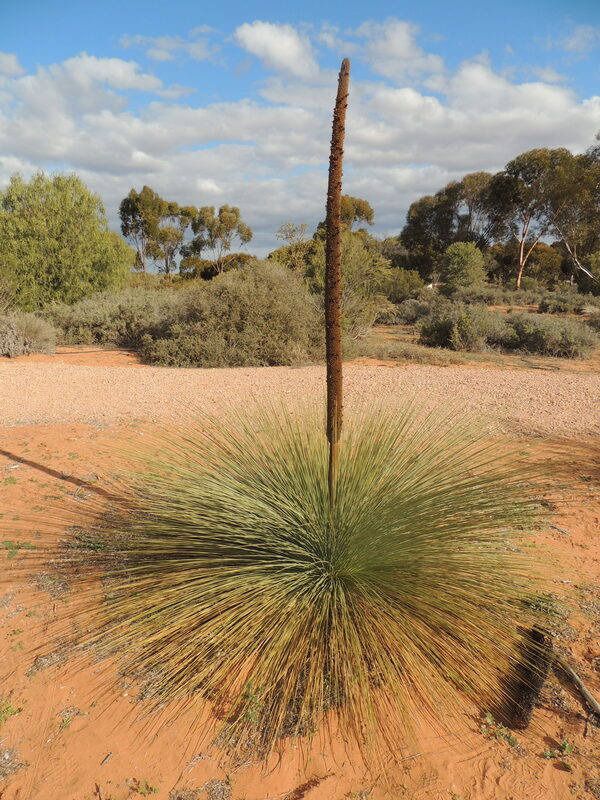 Grass trees, or Xanthorrhoea, are unique native plants and are extremely tough, withstanding fire and drought. The brown flower spike has gone to seed now, but birds love them when they are fully in flower and they probably love the seeds too. Just look at the uncompromising position of this grass tree. You would be forgiven for wondering if any plant would survive in that environment. 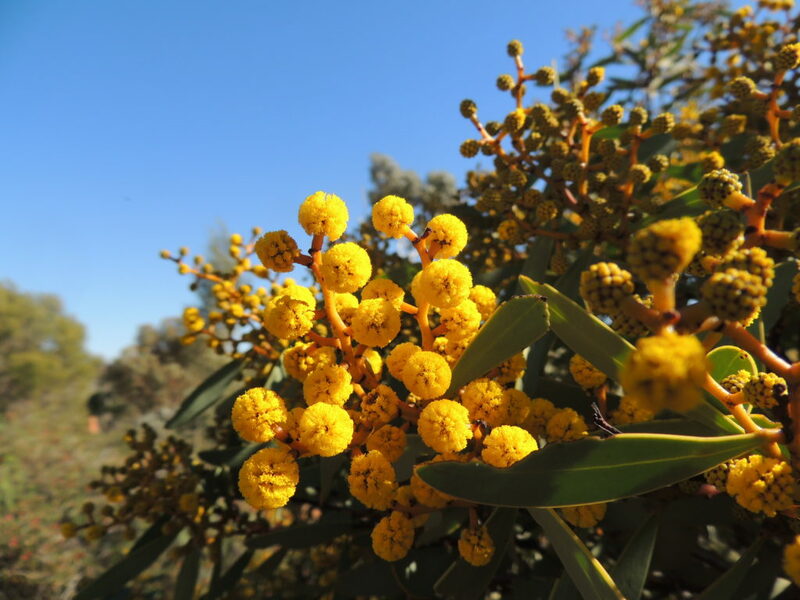 This Wattle is just beginning to bloom. 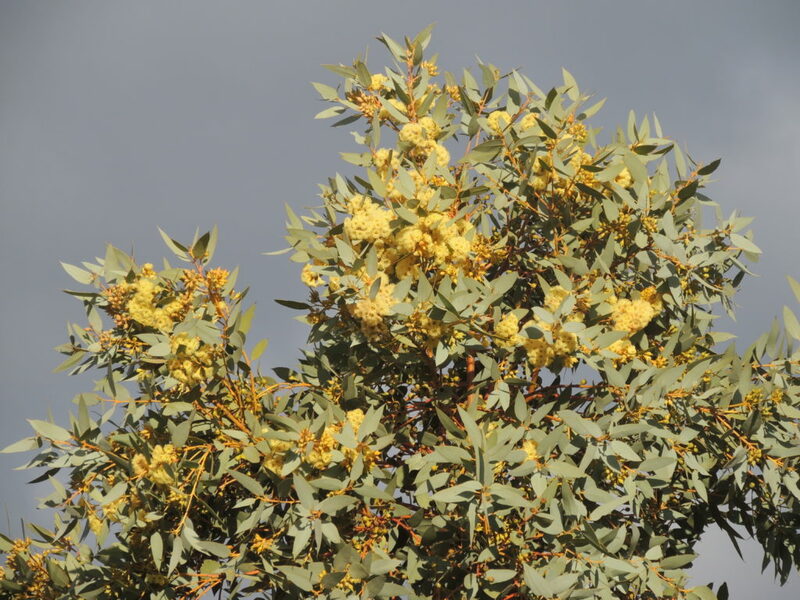 September 1st is Wattle Day in Australia, but I am sure on any given day; rain, hail, sun, drought, or fire, a wattle will be flowering somewhere in the country. Those jaunty yellow pom-poms are very attractive to bees. We were lucky to see this. Somewhat out of season, this Swainsona formosa, or Sturt's Desert Pea, the floral emblem of South Australia, was doing its best to bloom, but only putting out a couple of flowers. But what flowers they were! They come in several shades of pink and red, some without the black centre or ‘boss’, and more commonly with an even darker boss than the one above. They can even be white! In their natural habitat, Sturt’s Desert Pea plants spread out in a large mat, and I imagine they would be a wonderful sight to see. They are protected: it’s forbidden to even take a seed from a plant. Seeds can be purchased though, and I am going to try growing some this summer. Another feature of this botanical garden is the area displaying ideas for the home gardener to try, using native plants instead of more water-hungry exotics. 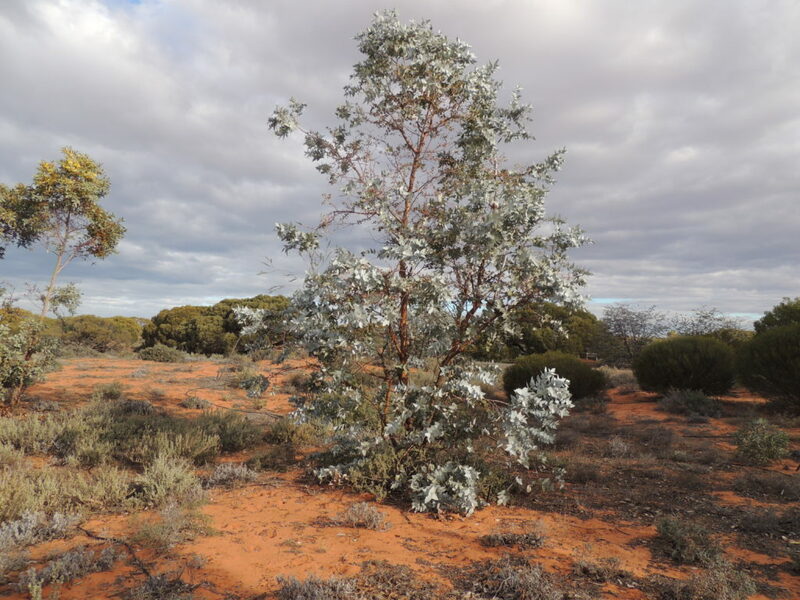 When we visited, there had been very little rain in this part of South Australia for a long time, and to be truthful, some plants, even though drought hardy, were showing signs of stress. Generally speaking though, it's just amazing how resilient our natives are in this climate. 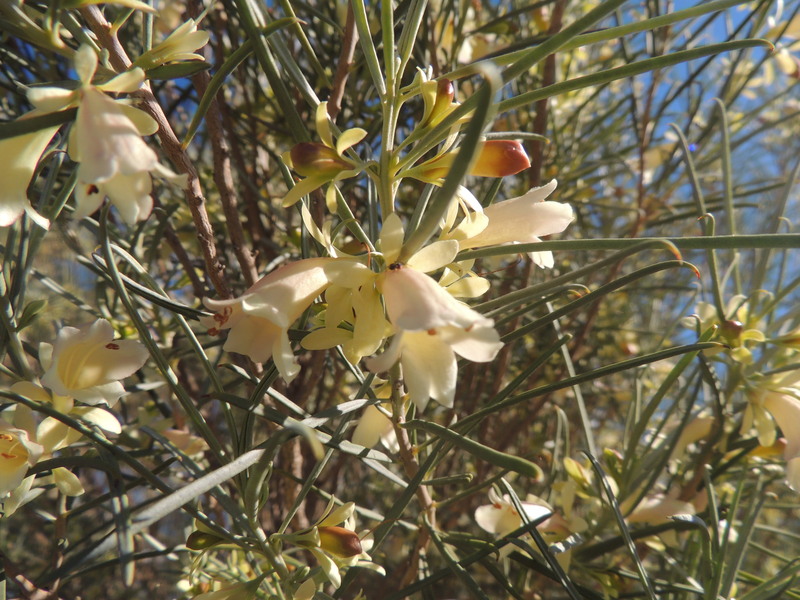 If you would like to read more about The Australian Arid Lands Botanical Garden, you can find some more information here. I like the idea of a Botanical Garden catering for a specific climate. Do you know of any gardens like this? Oh Jane, this post is such a wonderful treat! Thank you for your lovely close-up photos of the fantastic sculpture and all these fabulous plants! I love Australian plants so much and you’ve featured some of my favourites! Those are amazing gumnuts, what a great tree. Thank you for your kind comments, Liz. 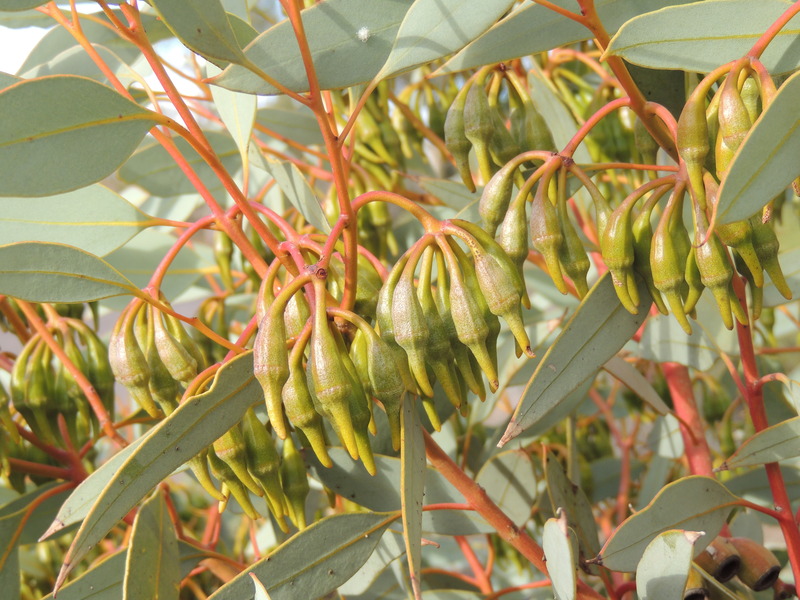 I particularly liked that eucalyptus..would love to see it in flower one day. Even though we travelled through Port Augusta many years ago we were not aware of these botanical gardens. Pity that we missed it. Thank you for bringing this beauty to our attention. With the present drought we might have to change our gardening preferences and stick to the hardy natives. We might have to do that Gerard, something I should keep in mind when I’m coveting some of the more delicate plants I’d like to grow in my garden. It always impresses me to see plants that thrive under seemingly merciless conditions. It gives me hope in the face of climate change. This botanic garden looks to be especially well-maintained, which can’t be easy under such tough conditions. Many of Southern California’s botanic gardens devote areas to climate-appropriate plants and I’ve noticed that several of these have expanded their collections of such plants over the past several years, including the one 5 miles from me, where I currently serve as a docent. It would make life a lot easier if we just grew what was appropriate to our climate, Kris, but somehow I always want to plant some of the more showy things! I think I have seen your Botanical garden on your blog, and I thought it was very impressive. Excellent post! I enjoyed the photos and text very much. Gorgeous and fascinating plants in a beautiful setting. Thanks very much for this tour! Thank you Tina, I’m glad you enjoyed it. I just love that gum nut. You have just prompted me – I went to the Royal Botantic Gardens in Cranbourne – south of Melbourne. I’ve been meaning to post some photos but I just need to get a round tuit. Then I will. That will be good, John, because we didn’t manage to visit Cranbourne when we were in Melbourne earlier this year. Thanks Jane for this wonderful look at a garden that’s slightly out of the way for most of us. I do wonder if the level of care is high though (as per Kris P ^) – I’ve seen a number of harsh ecologies where only the native plants had a niche and which naturally have a lot of open space – high-metal soils (ultra-mafic zones), arid zones, tundra and taiga – many such places look gardened when they are not. I do not know about SA’s weed flora though (but would like to). There were many ag pipes around the garden, Nigel, but we wondered if there was enough water to service the gardens, considering the conditions. The main point is that most things were surviving despite what the weather was throwing at them. I don’t know about the weeds either, being from NSW, but I imagine they’re pretty much the same as we have here. It sounds as though you have a BIG trip in the offing, PP. We gardeners do like the challenge of plants from outside our area, and what a pleasure it is when they flower! 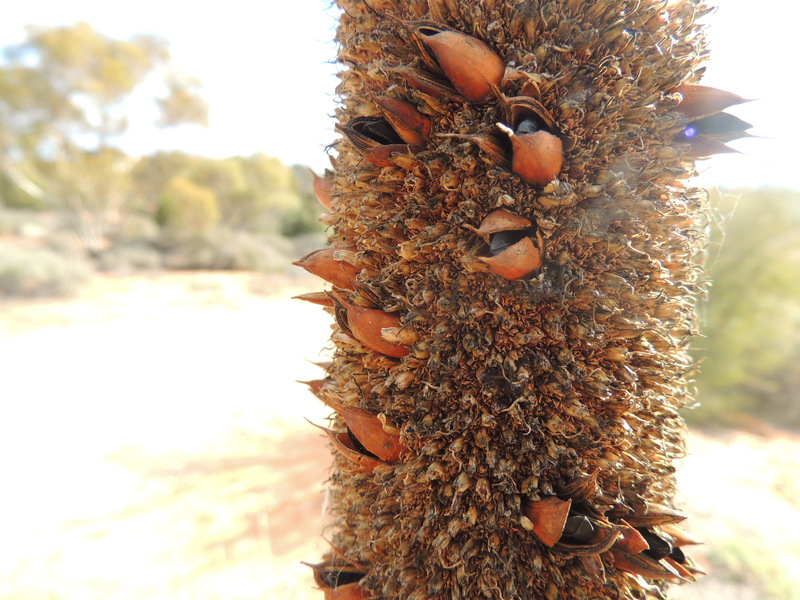 Lovely photos Jane- the Eremophilas and Mallee in particular. I’d love to visit that botanic garden. Thank you, Jane. Spring is surely the best time to see it. I have a friend who went at that time and pronounced it ‘splendid’! Another garden closer to me, is Tremenheere which is a sculpture garden as well as unusual in Cornwall for growing NZ, Australian and South Africa plants. I am sure they lost a few during the unexpected snow and cold temperatures, but I love visiting to see the Fynbos and the Xanthorrhoea. I shall have to have another visit and see if they have any Wattle trees! Oh, and I love that tormented sculpture! Hello Jude, thank you for your generous comment. I have looked at the Beth Chatto garden online and it is marvellous. I learnt about Fynbos only recently, particularly during the Chelsea Flower Show when I saw that beautiful garden there .Yes, the drought here is severe- we are in serious drought and the weather hasn’t even warmed up yet. Tomorrow we’re expecting -4 C, and I think the temps are affected by the lack of rain. I’ll check out Tremenheere online: it sounds very interesting. Sometimes, it does take a closer look to see what’s there, but you are so right that even arid climates have much to offer. We visited Red Rock Canyon outside of Las Vegas, Nevada, and I was surprise at how much there was to see, including very odd places were water pooled in 110 degree temperatures! That would have been fascinating to see. I looked at some photos online: what amazing landforms. I’d love to visit. I’m glad you enjoyed the tour Gill. A return to this garden in Spring would be great, just to see those trees in flower. It’s about 2000km away, so it probably won’t happen! 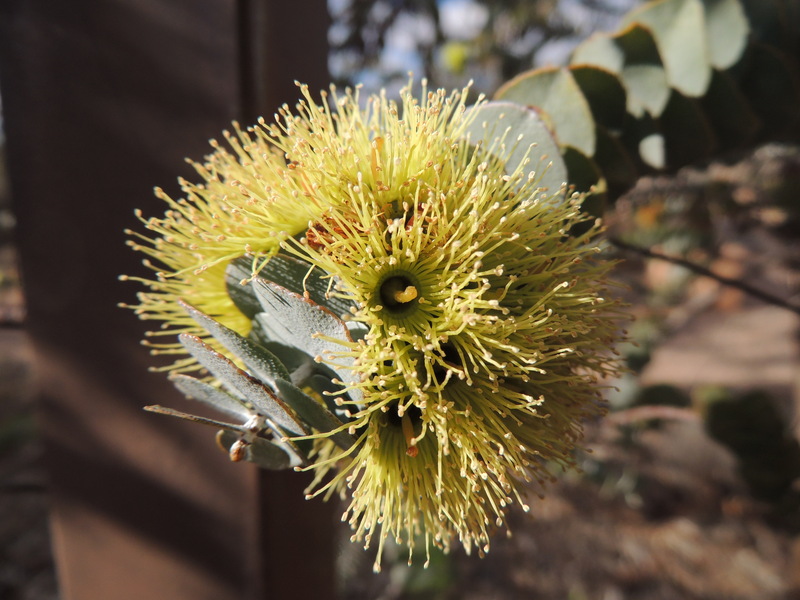 We visited this garden in mid October and all the flowering gums were in bloom. It was so beautiful. It would be interesting to visit in a different season. The sculptures are wonderful. Hi Carol, we were a bit early in the year to see the garden at its best, but it was till interesting. I’d love to have a return visit some time, but it’s a very long way to go! I’m so enjoying these posts. South Australia and the Flinders Ranges produced some of the best experiences on our trip. I remember the grass trees. But so many other delights here too. Your drought has made headlines here this week. It makes my need for rain after a particularly dry summer seem rather insignificant in comparison. Thanks so much, Jessica. I’m glad my posts are reminding you of a great trip. The drought has become very serious indeed, and we haven’t even got to spring yet. Need for rain is relative, I think. You grow plants that are probably less hardy than ours, so your garden is gasping too. I’ve read that the farmers in the UK are having a hard time of it as well. I’m growing quite a few Australian plants in my California garden, so it was a treat to see this post and some familiar plants growing in their native land. Thanks for dropping in! I’m glad you enjoyed the post. I’ll pop over and have a look at your garden. What a fascinating tour with stunning photos, Jane. Thank you! 🙂 Isn’t it incredible how resilient plants are, who would believe anything could survive such harsh conditions yet alone produce flowers and seeds? 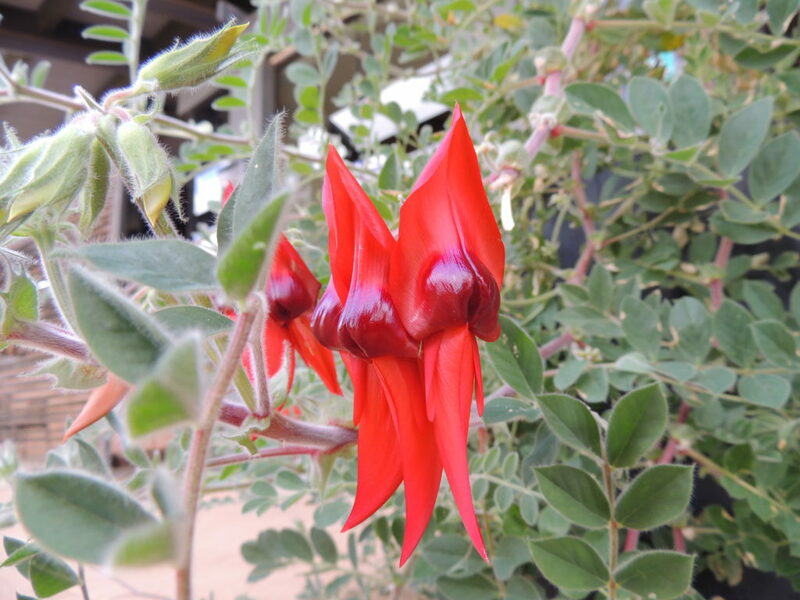 I love the Sturt’s Desert Pea, they look almost surreal, somehow – fabulous colour, definitely one for you to try. Those gumnuts are amazing and make our Asturian ones look rather puny in comparison (mind you, the eucalpts shouldn’t really be here at all)! I wonder if we will see more botanic gardens encouraging gardeners to grow local plants in the light of environmental and ecological issues? It’s interesting to ponder what would be possible and what would be banned! Oh, I wish you could too, Lis. Very interesting. The Sturt’s Desert Pea is pretty neat. Thanks, Lonnie. Hopefully I can grow some this summer. 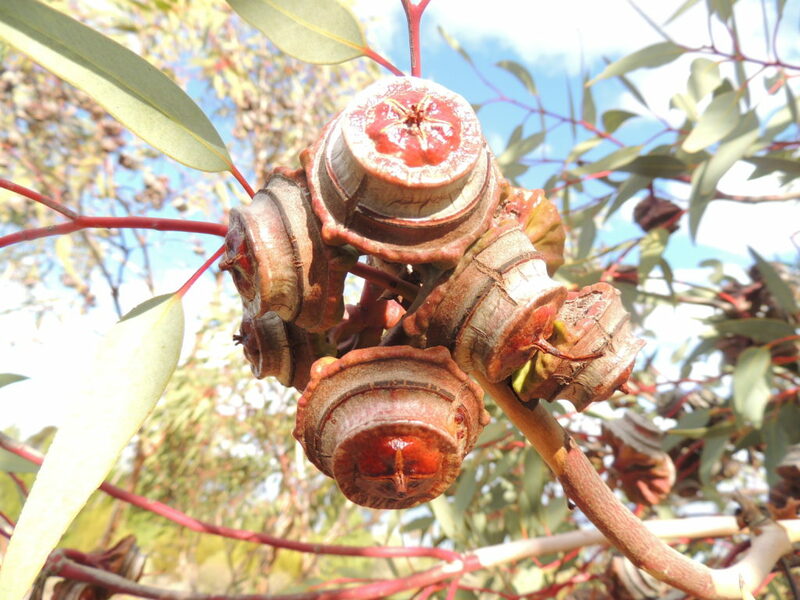 Very interesting post – Australia has some remarkable plants adapted to the specific conditions of particular parts of the country and it is fascinating to read more. In Morocco, French garden designers Eric Ossart and Arnaud Maurieres specialise in establishing arid gardens, but they use plants from all over the world including Australia, no doubt. We also saw eucalyptus groves, presumably planted for commercial purposes, north of the Atlas mountains during a recent visit, and I wondered if they were an appropriate choice. The trees are everywhere in Egypt, usually as perimeter markers around extensive estates/landholdings. One garden in the UK features a terraced hillside with each level dedicated to plants from a different zone in the world, with New Zealand ferns etc at the bottom and rising to arid plants at the top – this is the Abbey Gardens in Tresco, Scilly Isles. Conditions there are very unusual, and the story of the garden’s creation (and survival) is extraordinary. Thank you, Sylvia for your most interesting comment. I have looked at the Abbey Gardens online and they certainly look like a wonderful place to visit with a tremendous variety of plants.i can see that the Scilly Isles have a unique climate. I also looked at Ossart and Maurieres gardens….stunning. Perhaps I’ll see some of these gardens one day. I understand what you mean about eucalyptus trees being an appropriate choice. They are so very flammable. When we were on holiday in Portugal, we saw huge plantations of them and I later wondered if they contributed to the ferocity of the recent fires there.